Real Time Search Missing From Google - Did You Notice? 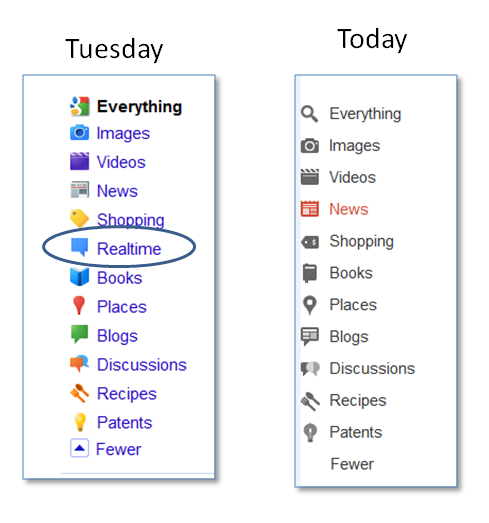 Real Time Search Missing From Google – Did You Notice? Not sure if you noticed or not, but real time search results are missing from Google. The reason for this is Twitter’s agreement with Google that was launched in October of 2009 actually expired on July 2nd. According to Google, although there will not be access to the live search results, information that is publicly available from Twitter will still be crawled and accessible in the normal Google search results. Apparently the partnership didn’t turn out as expected, otherwise I believe we’d still have live search results streaming from Twitter.